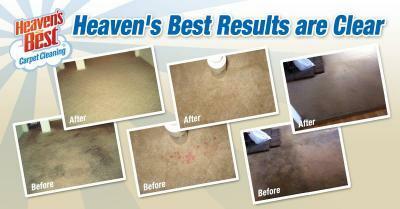 Here is proof that Heaven’s Best Carpet Cleaning does an excellent job getting out spots and stains and making carpets look great! Here are some carpet cleaning before and after photos from carpets in Birmingham AL. These photos show some very dirty spots and stains that Heaven’s Best was able to get out. We take pride in our work and we have many different cleaning solutions that are specialized to get out almost any stain. We have coffee stain remover, red wine remover, black grime remover, ketchup remover, and Kool-Aid remover. You name it; we have a professional spot remover that will clean it. We are very detailed and take extra time to get out the worst spots and stains. We will leave your carpets looking clean and bright, just like these photos show. This is why are customers say we are “heavenly.” They are amazed at some of the stains we have been able to get out. Even if we can’t get a spot completely out, we will clean it as thoroughly as possible so it is barely noticeable. If you carpet has spots and stains or just looks old and dingy, call Heaven’s Best of Birmingham at (205) 618-9150 to schedule a carpet cleaning. Along with great service, we also offer great rates that can’t be beat. These carpet cleaning before and after photos in Birmingham AL are a testament that we really can get some of the toughest stains out.